SIMPLE - CRYPTOCURRENCY AND FIAT OPERATIONS. No matter what your currency of choice is, you can operate on the market with one single mobile app. Pay, invest, lend and loan, exchange currency anywhere, with just one tap. SAFE - LICENSED BUSINESS AND BLOCKCHAIN FORENSICS. We have the same level of compliance as your bank. Money deposits are curated in accordance to AML and KYC legislation. We are established in Luxembourg, where compliance is taken very seriously. OPEN - MORFIN USES THE LATEST PEER-TO-PEER CONCEPTS. It creates a trust-worthy community, verified via transparent tools. Our members offer financial services to each other in a compliant, lawful manner without the need to get off-grid. All you need to go through the day and manage your personal finances. 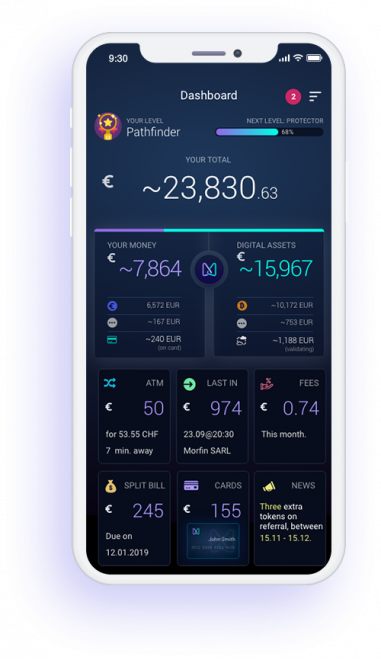 a wallet solution that will survive any attack AND any regulation, offered by a regulated entity located in Luxembourg. We are testing our prototype app for new, society-oriented financial services. We need as many opinions and as much feedback from You as early adopters. We’ll also reward you with equity for spreading the word and growing our community.